As a famous Taoist shrine, Wudang Mountains are located in Shiyan City, Hubei Province. Also called Taihe and Xuanyue Mountain, it is renowned for its magnificent ancient building complex and appealing natural landscape. In 1994, the Ancient Building Complex in the Wudang Mountains was included on the World Heritage List by UNESCO. Besides, the mountain is said to be the birthplace of the famous Chinese Wudang Martial Arts. Construction of the Ancient Building Complex started in the Tang Dynasty (618-907). During the reign of Emperor Taizong , the Five Dragon Ancestral Temple was built on Wudang Mountains. In the Ming Dynasty (1368-1644), about 33 palaces and structures including the Yuxu Palace, the Grand Purple Cloud Palace, the Yuzhen Palace and the Palace of Harmony were built. Then the grand and magnificent building complex was formed. At present, the extant building complex includes the Palace of Harmony, the Grand Purple Cloud Palace, the South Cliff Palace, the Yuzhen Palace, relics of the Yuxu Palace and the Five Dragon Ancestral Temple, Xuanyue Gate (a huge archway) and the Fuzhen Temple. Situated on the south section of Tianzhu Peak, the Palace of Harmony is composed of the Golden Palace (Golden Peak), the Forbidden City and the Gutong Hall. The Golden Palace is the most celebrated. Constructed of bronze, the palace is about four meters (13 feet) long, three meters (10 feet) wide and six meters (20 feet) high. In the hall stands the statue of Emperor Zhenwu in the shrine with Golden Boy and Jade Girl, and two generals of Fire and Water attending him on the left and right. It is said that the statue of Emperor Zhenwu is about ten tons (22,046 pounds). Above the shrine is hung a golden plaque with four Chinese characters 'Jin', 'Guang', 'Miao' and 'Xiang' written by Kangxi, an emperor in the Qing Dynasty (1644-1911). Through the ages, the palace still presents its glamour and grandiosity. Located below Zhanqi Peak, the Grand Purple Cloud Palace is the most magnificent and best-preserved Taoist building on Wudang Mountains. Covering an area of 6,850 square meters (two acres), the palace consists of the Dragon and Tiger Hall, the Stele Pavilion, the Shifang Hall, the Parents' Hall, the Grand Hall of Purple Cloud Palace and other buildings. Covered with blue glazed tiles and yellow and blue carvings on the roof, the Grand Hall is the most representative wooden structure on the mountain. In the hall is worshipped the sculpture of Emperor Jade which was made by a Ming Dynasty artisan. The South Cliff Palace is situated below the Duyang Cliff. It has the Tianyi Zhenqing Hall, the Two Bearings Hall, the Eight Diagrams Pavilion, the South Heaven Gate and the Flying Cliff. Built in the Yuan Dynasty (1271-1368), the Tianyi Zhenqing Hall is the most renowned. All the beams, pillars, doors and windows were carved from stone. This stone palace is a masterpiece of Chinese stone carving. The Yuzhen Palace, the relics of the Yuxu Palace and the Five Dragon Ancestral Temple, Xuanyue Gate (a huge archway) and the Fuzhen Temple are also must-sees on the mountain. In addition, many sculptures, offerings and sutras in the palaces, tablets and inscriptions on the cliffs are precious relics and worth a visit. The mountain is also celebrated for its appealing natural landscape including 72 peaks, 36 rocks, 24 streams, 11 caves, nine springs and three ponds. At any time of the year, tourists can enjoy its wonderful natural scenery. By train: Take a train from Beijing, Shanghai, Chongqing, Guangzhou, Nanjing, Qingdao, Wuhan, or some other cities and get off at Wudangshan Station. Transfer to intercity bus no. 202 or 203 to the scenic area directly. 1. From Shiyan: Intercity bus no. 202 can take visitors from Shiyan Railway Station to the mountain within 70 minutes. 2. From Xi'an: Two direct tourist buses to the scenic area are scheduled at the Provincial Bus Station opposite Xi'an Railway Station, leaving at 09:00 and 15:00. It takes around 4 hours. 3. From Wuhan: One direct bus is available from Jinjiadun Bus Station, departing at 13:40 daily. It takes around 6 hours and costs CNY179/person. By air: Tourists can fly to Wudangshan Airport from Xi'an, Tianjin, Kunming, Wuhan and Hangzhou. Then take a taxi to reach the mountain at a cost of CNY60-80. 1. Visitors need to pay extra CNY 5 for insurance. 2. Visitors can take the sightseeing bus unlimitedly with a valid ticket. I arrive to Xiangyang airport from Beijing. Is there direct bus from Xiangyang airport to Wudangshan? Upon landing, take public bus no.602 to Tourist Coach Station first. Then take the long-distance bus to the mountain area. The bus schedules are 08:00, 14:30, 15:30, 16:40 and 18:00. Thank you for information! Do you know what the bus fare is in Xiangyang and for long-distance bus to Wudangshan? As I know, the ticket fare is CNY45/person. I will arrive at Shiyan Airport on 10/11/2018 at 18:30. I want to take a taxi from Shiyan airport to my hotel, Wudangshan Tianbao Jiuru Inn, the hotel is located outside the Wudang mountain park, so I am not worried about the park gate being closed. Will it still be easy for me to find a taxi at that time? How much will the taxi ride be (approximately) and how much should I tip? I read on this website there is bus 202 or 203 going from Shiyan airport to Wudangshan. Till what time does the bus run and how much is the bus fare? Hi, if you take s bus, the fare is about CNY 120 and you can find a taxi easily. You don't need to tip since there is no tip habit in China. Only shuttle bus line 2 can take you to Wudang Scenic area and it departs at 13:30 and 16:30. It takes about 1 hour and the fare is CNY 15. 1) do you know if there is a bus from Wudangshan to Xi'An and it's timetable? 2) is the Five Dragon Temple closed? 1. You need to go to Shiyan City and then take a bus to Xi'an, the departure time is 8:30, 10:00, 12:00, 13:50, 14:30, 17:00. 2. Which Five Dragon Temple do you mean? I didn’t find any Five Dragon Temple on the way. Either one takes at least 7 hours, is there any better way of doing it (without doing the night train). If I do option 1, should I reserve the bus tickets in advance (how? as a I'm a tourist and do not have a chinese number), I'll be in the Wudangshan area around 8/19. Hi, you’re right about the bus station. You can consider taking a fight from WDS to Xi'an since it’s not so expensive at that time and it will be more convenient. Generally, you can’t book bus tickets in advance and the reasons are as you said. 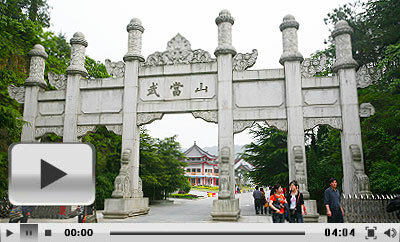 can i purchase wudangshan park entrance tickets online from overseas? also, can someone suggest the best way to go from wudang mountain to Xi'an? It seems there is no English website for booking their tickets, and you can just buy them at the entrance of the scenic area. You can take a bus line 202 or taxi to Shiyan Railway Station and then take a train to Xi'an. There is only one train departing at 1:00 am and you will get to Xi'an at 7:00. You can also take a coach in Shiyan high-speed passenger station. Is there any speed train from Hongkong to Wuhan and how long is the ride? Yes, it has been test run in this year and it takes about 4.5 hours for a single journey.